I bought a gun many years ago for personal protection. It was a snubnosed revolver. I didn’t pay much for it as guns go. I didn’t train with it, or practice with it and mostly it remained in a drawer, unloaded, for most of two decades. It’s the gun that prompted me in 2012 to get training, buy other guns and start competing. So it has a bit of a special place in my shooting journey. In February 2012, I took it to an NRA 1st Steps Pistol class. It was painful to shoot, but I hit paper and I was thrilled. I had a bit of work done to it as I started getting more interested in shooting. I replaced the small wooden grips with slightly larger rubber grips to make it easier to hold and less painful to shoot. I asked a friend re-blue the short 2” barrel where a bit of rust had taken hold. But the cylinder jammed on me multiple times and the few people I knew to ask couldn’t help me figure out how to fix that. So it went back into the drawer as I moved my affections first to .22LR then to the 9mm flavor. 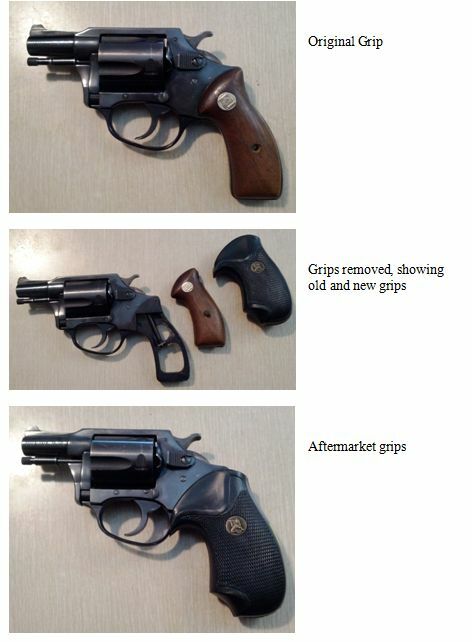 I’d always heard revolvers didn’t malfunction, but clearly that wasn’t true. Last September I made a new shooting friend, Adam. He likes to tinker with guns and based on the work I’d seen him do, he has a talent for it. He asked to see the revolver after it came up in a conversation. He said he might be able to fix it so I left it with him after an afternoon of shooting. I got a bit of grief over the fact that there was rust and lint inside the gun, but it was worth the teasing. He fixed it. He test fired it and asked me to pick up rounds known to have hard primers (Blazer Brass) to verify there would be no light strikes with the firing pin. He showed me a bit more about the gun. He walked me through the process of removing the hammer spring with such high tech tools as a fork and a paperclip. Really. He showed me how to polish the rod the that the hammer spring rides on to get the gritty feel out of the trigger. I thought it was great to actually understand more about how my guns worked. The other thing he helped me with was painting the sites. The front site is part of the frame and with the shallow black sites are a bit hard to see if the light isn’t good, so I took painters tape to the front of the barrel and put a few thin layers of bright orange paint on the fixed front site. As I said, this wasn’t an expensive gun and it could always be removed with a bit of paint thinner (or gun solvent as it turns out). Then he asked me to shoot it. I shot 50 rounds through it over two days. It didn’t hurt to shoot as much as I thought it would. These were lead rounds I must have bought soon after I got the gun. He told me that I needed to clean the gun well after shooting leads rounds and before shooting jacketed rounds through the gun. The jacketed rounds can push in lead deposits into the rifling of the barrel and, over time, damage the barrel. I thought he was just giving me a hard time, telling me this as he knows I’m not the best at cleaning guns. But I asked around and found at least 3 other friends that confirmed that advice. I really wanted to hear a different answer, but figured that after he spent the time to work on the gun I should step up and treat it well. I found this discussion when I sat down to write this blog entry so clearly there is some disagreement. But I did clean the gun thoroughly after I sent the entire box of rounds down range. I’ll only be buying jacketed rounds from now on. I noticed that one of the 5th Sunday BUG Matches was scheduled the 31st of January at The Range in Oxford and decided to shoot the match with this gun if the BUG gun limit was 5 rounds. I called and confirmed that was the case. After putting this much effort into fixing up the gun, I wanted to shoot it in a match and this was an excellent choice. There are no reloads on the clock, there is a limit of 5 shots per string, and no holster is required. And you get to do “New York Reloads”. So stay tuned… and I’ll let you know how it turned out.